Sweden is ranked number one in sustainability surveys, and on track to be the first nation worldwide to fulfill the UN’s SDGs, perhaps as early as 2030. Among its strongest suits is renewable energy – wind, bioenergy, hydroelectric – that accounts for more than half (55%) of gross energy consumption, followed by Finland (41%), Latvia (39%), Denmark (36%) and Austria (33%). It is determined to push up efficient energy use by 50% in the next decade and finish with a 100% renewable-energy supply in 2040. The newly re-elected leftist government should meet its target to achieve net zero greenhouse gas emissions by 2045. Keys to Success: high level of citizen involvement, smart investment, engaged red-green national governments. Last year in May, Portugal ran the country for three days in a row on renewable energy alone and even managed to export power during the streak. Little known even in Europe, Portugal has a higher share of fluctuating renewables in its supply than Germany, and steeper clean-energy growth rates, too. Renewables are expected to cover 80% of electricity consumption in Portugal in 2030, a goal that a massive, ongoing roll out of solar PV will help facilitate. According to The Portugal News, Green energy currently saves the country around €750 million in fossil fuel imports. “The growth of renewables in Portugal is now so fast that officials are questioning planned investments in gas infrastructure,” says R. Andreas Kraemer of the Berlin-based think tank Ecologic Institute. The rapid shift to renewables has endowed Portugal with “a wealth of experience in the operational management of grid, including forecasting,” he says. Keys to Success: Incredible natural resources, engineering prowess. Portugal has no fossil extraction industry. 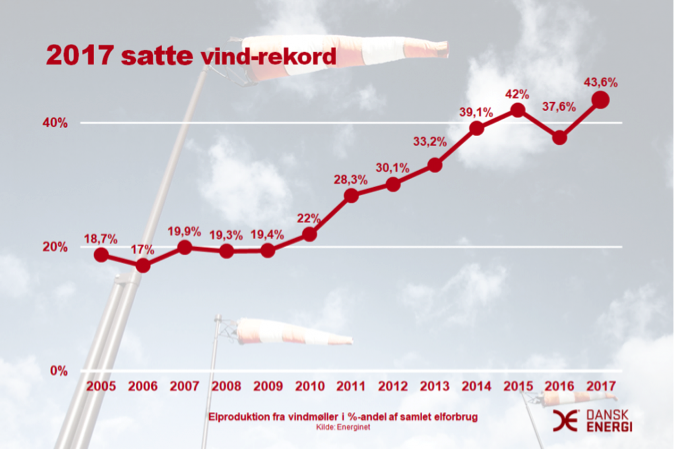 Denmark, the cradle of European wind power, generates close to half of its electricity consumption (43.4%) from its stiff sea breezes. And the Danes’ security of supply is among the highest in Europe at 99.995%. Denmark is home to Europe’s largest wind turbine maker, Vestas, and the most sought-after offshore wind farm developer, Orsted. Vestas has installed over 60,000 turbines across 76 countries. Keys to Success: Early pioneer in the field, wind galore, extensive district heating systems, dense crossborder grid. The U.K. is home to 39 of Europe’s 105 offshore wind parks with a total of 1,957 operational turbines. Since 2016, the U.K. has generated more power from the wind (sea- and land-based) than from coal, its traditional mainstay. The five floating turbines at Hywind Scotland Pilot Park are the first of their kind in operation. Hywind’s turbines are about 253 meters in height, about a third of which is beneath the water. Each of the towers is tethered to the sea floor by chains weighing in 1,323 tons. At full capacity, the park will generate enough electricity to supply 20,000 homes. 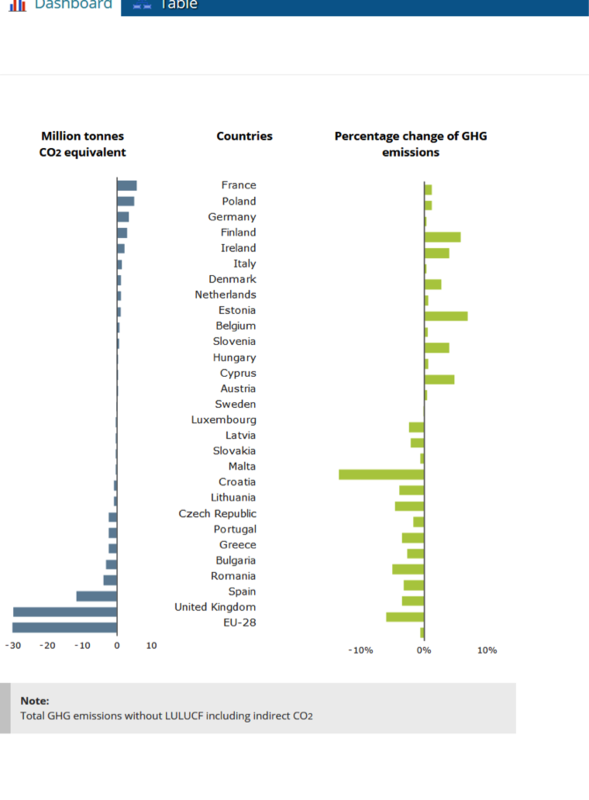 In 2017, the latest numbers available, the UK posted (in terms of absolute changes) by far the largest decrease in GHG emissions in the EU. The drop was a result of shifting from coal and natural gas to renewable energies. In relative terms, the largest decline happened in Denmark (5.3 %), followed by Finland (4.6 %) and the U.K. (2.6 %). Keys to Success: a record 52% drop in coal use in 2016 followed by a further 19% decrease in 2017. U.K. has committed to end coal use by 2025. But also: many manufacturing facilities have moved overseas. Downtown Oslo maintains that the only thing better than e-cars is no cars at all. The city center is largely car-free as of 2019, and apparently it’s working out fine, so far. Oddly, Norway doesn’t have a car manufacturer today. The Nissan Leaf is the most popular all-electric automobile there. Keys to Success: Strong environmental consciousness, deft civic planning, extensive green transportation infrastructure, lavish incentive scheme. Norway rewards e-car buyers with hefty rebates and other perks worth thousands of euros. Moreover, urban drivers can avail themselves to an array of perks such as free parking, access to bus lanes, and toll-free travel. The EU has led the way on so many climate and energy issues that its impact over the years vastly outstrips that of any one state or region. Europe’s renewable energy boom, for example, is unthinkable without the EU’s opening of energy markets and the prying apart of energy production and distribution sectors (called “unbundling“) in the 1990s. In Germany, for example, the dismantling of the energy-market monopoly of four giant utilities paved the way for tens of thousands of small producers, citizen’s collectives, localities, and cooperatives to forge ahead with renewable energy generation, known as the Energiewende. Among the most salient measures of all, last year the EU agreed that renewables must make up 32% of energy consumed in Europe by 2030 (binding target) and that by there be a 33% increase in energy efficiency. 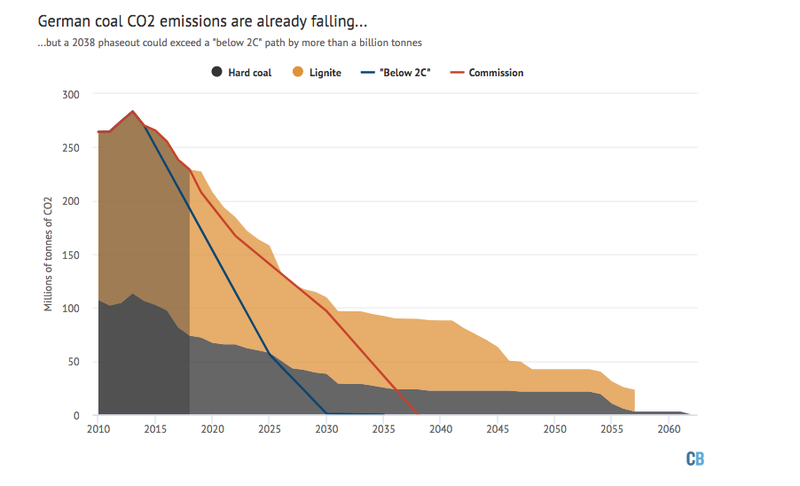 Thanks to its targets and pressure – as well as communism’s fall and the financial crisis — the EU as a whole has already hit its 2020 goal of sinking greenhouse gas emissions by 20% (compared to 1990.) And the EU has pledged that from 2021 to 2027, every fourth euro of the EU budget — one trillion euros ($1.2 trillon dollars) — will go toward climate protection. For Europeans concerned about climate change, and polls show it’s the vast majority, these are solid reasons to back pro-EU and climate-serious parties in the May European Parliament elections. Over the past decade, ministers of industry in the Czech Republic have alleged that solar has no potential and is expensive. However, a wave of interest in solar did come to the Czech Republic from the dynamic global developments in this unique technology – and the Czech system was not prepared. The first wave in 2009 sparked solar growth and was followed by exponentially increased growth in 2010. The Czech Republic suddenly had almost 2 000 MW of solar capacity installed. This jump-start of growth was also projected into the cost of electricity, given that consumers in particular were paying for state support of solar. The problem was not how the amount of such support was set up. However, the Czech Republic had no aims for how many new renewable projects should be brought online per year. Unfortunately, solar park owners became labeled as the culprits, and politicians began using the derogatory label “solar barons” for them in the media. Today this shorthand is exploited mainly by Czech President Miloš Zeman, but in the past it was also commonly part of statements made, for example, by the chair of the Energy Regulatory Authority. The main problem was, however, a mistake made by the regulation. However, nobody was looking for it there. As a corrective measure, the previous administration pushed through a special solar charge, the so-called solar tax of 26 % imposed on installations dating from 2009 and 2010. The charge was to have applied for three years, during which project owners lost part of their state support. The charge was then extended for solar parks dating from 2010, set at 10 % for as long as they drew on state support. Solar owners believed the measure was not just retroactive, but contradicted the aim of increasing renewables. However, their lawsuit failed before the Constitutional Court. Several international arbitrations are still underway. The impact of these moves on solar has been merciless: Since 2011, no big solar projects have been implemented in the Czech Republic. What is annually growing is rooftop solar, with a capacity of 6 MW to date. 2018 appears to have been slight promising: Rooftop solar growth has doubled year-on-year. During the first 11 months of 2018 there have been more than 1 500 applications for support paid out with a capacity of 6 MW. From the perspective of new project growth in other European countries, the Czech example appears embarrassingly small. Nevertheless, domestically it appears to be a success after the years of decline. Firms performing installations now enjoy a predictable, stable environment. They are able to offer solar solutions for heating water, either alone or in combination with batteries or heat pumps. Families are able to request support for installations, depending on the type of system, that ranges from CZK 30 000 to CZK 150 000 (EUR 1 150 – 5 770) from the New Green Savings program. Bigger projects of up to 1 MW of capacity can also be commercially implemented. The Czech Industry and Trade Ministry has already issued two calls through which firms can request investment into photovoltaic electricity generators. However, the condition is that the power generated be used directly on the firm’s own premises and that the equipment be installed on that particular building. During 2018 several projects on the order of hundreds of kilowatts have been built. Unfortunately, no other call has been announced and the companies are thus postponing their investments into renewables. Within the economic (i.e. feasible) potential, the installed capacity of solar plants could increase up to 3,5 GW in 2030 and 5,5 GW in 2040. For the repeated startup of such constructions, however, bigger solar projects in the Czech Republic lack two basic things: Good laws and political support. The Czech Industry and Trade Ministry is currently drafting an amendment to the law on state-supported energy. After about a year of debate with experts, a bill has been drafted to introduce auctions for new renewable projects, inspired by a German law which began a very interesting reduction to the costs of new projects there, especially for photovoltaic parks. However, the Czech Industry and Trade Ministry bill does not count on auction opportunities for new solar parks. According to associations of modern energy professionals, the Czech ministry’s move makes no sense. In the associations’ view, the law should be neutral with respect to technology. Moreover, it is exactly solar that has the greatest chance of offering consumers cheap electricity, which would be advantageous. The same ministry is pushing the Czech Government to support new nuclear reactors, which are exponentially less advantageous than solar for consumers. Unfortunately, chances to build new solar parks, whether located in brownfields or on the grounds of spacious industrial campuses, are also not part of the Czech climate-energy plan the Government is meant to send to the European Commission by the end of the year to present its strategy for fulfilling its emissions-reduction obligations by 2030. According to the versions of the plan that have leaked to date, the Industry Ministry only wants to support solar projects with a capacity of 30 kilowatts or less. Despite these small steps forward, the Czech solar energy sector is still waiting for somebody with a clear political vision to arrive on the scene. For the time being the Industry Minister, Marta Nováková, unfortunately remains behind the current energy trends. It was a very successful campaign, as evidenced by the fact that today coal is slipping to only 25% of total US electrical generation, as gas closes in on 40%. Its meteoric growth has always been framed as clean energy, blunting the demand for non-hydro renewables, which have been politically fenced in to only 10% of total capacity. Instead, throughout the US, 60 percent more fugitive methane was being released into the atmosphere through leaky oil and gas production than previously measured, the journal Science reports. In retrospect, when “including methane emissions released during production and transport, in particular the massive fracking emissions which have quickly increased, natural gas is no better than coal,” said climate researcher Niklas Höhne of the NewClimate Institute in Cologne in an interview with Germany’s Deutsche Welle. “If all emissions are considered, natural gas could actually be worse,” he said. Sitting in the middle of Europe, Germany is already the world’s largest importer of fossil gas. Though only partially used for generating electricity (about 13% of total), its historically high prices lead many energy experts to assume that it won’t be able to compete with ever-cheaper renewables and take over the space left behind as coal is phased out. Likewise, executives at utility Uniper, Germany’s single biggest customer of imported Russian gas and a partner in the Nordstream2 pipeline and various LNG terminal projects, are assuming “that there will be additional gas import demand of 150 billion cubic metres per year by 2030 in Europe,” chief financial officer Christopher Delbrueck said at a news conference on the presentation of the company’s 2018 earnings. Evident of the new gas rush: shipments of U.S. liquefied natural gas (LNG) have also increased through March following Russia’s record gas flows to Europe in 2018. As reported last week, the UK finally launched its long-awaited Offshore Wind Sector Deal which will see the country’s offshore industry invest at least £250 million so as to ensure offshore wind generates more than 30% of the country’s electricity by 2030. The plan also calls to triple “green collar” jobs by 2030 and ensure that at least a third of all these jobs are held by women. A day later, UK Prime Minister Theresa May toured Orsted’s Grimsby offshore wind factory and gave a speech regarding the country’s much-ballyhooed Brexit — its disastrously messy attempt to leave the European Union. “Your work in offshore wind does not just provide skilled jobs here in Grimsby, it makes a direct contribution to the UK’s efforts to reduce our carbon emissions and protect our environment,” said May. “Achieving the economic benefits of the global shift to sustainable green growth is one of the four Grand Challenges in our Modern Industrial Strategy,” — of which the country’s several Sector Deals — “Partnerships between the government and industry on sector-specific issues can create significant opportunities to boost productivity, employment, innovation, and skills” — are a key part. “The UK is the world-leader in oﬀshore wind, and yesterday we launched our Offshore Wind Sector Deal to build on that success,” May added. The focus for many in the UK at the moment, albeit briefly, remains on the mammoth Offshore Wind Sector Deal announced last week, which will see the UK offshore wind industry invest £250 million, including new an Offshore Wind Growth Partnership to develop the UK supply chain — as global exports are set to increase five-fold to £2.6 billion by 2030 — which will help to triple the number of industry jobs to 27,000 by 2030. “Now that we’ve sealed this transformative deal with our partners in government, as a key part of the UK’s Industrial Strategy, offshore wind is set to take its place at the heart of our low-carbon, affordable and reliable electricity system of the future,” said Benj Sykes, Ørsted UK Country Manager for Offshore and Co-Chair of the Offshore Wind Industry Council (OWIC), which was involved in negotiations with the Government. The news was unsurprisingly welcomed by the country’s renewable energy groups. The Sector Deal was also unsurprisingly hugely appreciated by companies of all sizes across the United Kingdom. Joshua S Hill is author of CleanTechnica and writes about clean power and renewable energies. Colombia is one of the major coal exporters in the world. Since its liberalization, the mineral-rich country has increasingly relied on extractivist projects. Extractive mega-projects within Colombia have great repercussions for local human rights. The most important export commodity of the mining industry is hard coal, which is at the same time a main contributor to the destruction of local livelihoods. Colombia’s resource policy has been shaped by extractive mega-projects for decades. Foreign investment and projects of transnational companies within the mining sector are now typical. El Cerrejón, a well-known mining project in the northern part of Colombia, incorporates one of the largest hard coal mines in the world. The vast majority of entrepreneurs are appointed by foreign companies aiming at further expanding the booming mining business in Colombia while representing the interests of their own national energy sector. In addition, unequal trade agreements in the past contributed to low commodity prices. This, in turn, has a negative impact on the development of national processing industries, hence promoting Colombia’s greater dependence on resources. The open-cast mining taking place in Columbia is based on constant expansion of new coal mines. Those residents who are not forced out by coercive relocation have to leave to escape water and land scarcity. In recent years, this development has led to a significant deterioration in local living conditions. The resistance towards those extensive mining activities is constantly growing among the Colombian society. Since 2015 democratic referendums, also referred to as consultas populares, have been increasingly used to initiate local votes against extractive mega-projects. Thus social movements had to gather more than twenty percent (20%) of the respective electoral census in order to initiate such votes. Harnessing information and network meetings, citizens were informed about the relevance of the issue, subsequently seizing their right to vote regarding future extractive projects. A number of referendums even resulted in the complete rejection of intended mega-projects, such as in 2017, when the Cumaral municipality in Meta prevented a project of the oil company Mansarovar Energy. However, the oil producing company Mansarover Energy,which was restricted by a referendum held in the municipality of Cumaral, filed a suit against the vote and finally won the case at the Colombian Constitutional Court in October last year. The notion arose that local consultas populares should not determine the implementation of national mining projects. After the judgment of the case, the court found in general that there were no appropriate mechanisms to ensure both civic participation and the way to reconcile the principles of coordination and interaction of the nation and territorial units in Colombia. Therefore, the Congress of the Republic was asked to introduce new mechanisms as soon as possible. At the national level has been an effort to propagate the superiority of national over local interests. For example, Colombian President Ivan Duque’s election program devalued the effectiveness and legitimacy of consultas populares. Likewise, the Congress proposed a law that referendums on land management were no longer legal, which was then passed on 13 February 2019 by the Colombian Constitutional Court. This verdict invalidates Law 136, allowing citizens of municipalities to hold consultations when the development of tourism, mining or other projects has resulted in a significant change in local land use. Hindrance of social participation regarding mining questions leads both human rights violations and the continuation of a vicious cycle of increased national dependence on natural resources and further environmental damage. This means that now, the only remaining option for consultations is through referendums initiated by mayors. But due to the known cases of corruption among politicians, this approach reduces social participation and cannot be considered constructive. While politicians of the Global North perceive themselves as sustainable and promote national coal phase-outs, coal extraction continues within other countries such as Colombia. This further increases greenhouse gas emissions, not only on the national level, but also in the international context. However, if global CO2 emissions were to be assessed on the basis of mining company ownership and not the country in which they are emitted, countries that are significantly involved in mining sites in Latin America, Africa or Asia would score immensely higher. German companies such as RWE and E.ON or the Australian-British raw materials group BHP are just a few of many international companies involved in the mining of Colombian hard coal and thus making a significant contribution to CO2 emissions. While Germany and Australia show off with sustainable guidelines, national companies simply shift their CO2 output to other countries. This hypocritical policy continues in order for the Global North to maintain their own energy security. Looking at the international context, it becomes clear that the abolition of consultas populares in Colombia is not a decision based on only local and national dynamics. It was also a decision determined by economic dependence on international investors. The abolition of consultas populares and the associated devaluation of democratic participation is a step towards increasing extractive activities, and hence towards rising C02 emissions. This responsibility for this dramatic development, however, should not only be seen within Colombia itself, but worldwide. Anna Skarbek is CEO at ClimateWorks Australia and writes about climate and energy. Anna Malos is Project Manager of ClimateWorks Australia and wirtes about climate and energy policy. This article has been republished from The Conversation. The fact that climate change poses a threat to global economic growth is not a new insight. As far back as 2007, Nicholas Stern in his team at the London School of Economics found that it could lead to a recession of 20 percent of global if the world did nothing about climate change. Of course, these economic effects are felt differently depending on a country’s geographic position and economic wealth. It is therefore vital for countries such as Honduras whose economy depends heavily on agriculture to take a holistic approach to climate change adaptation and mitigation. Let’s take a look at the two most pressing climate change impacts in Honduras, which cost the country millions of dollars every year. Severe water scarcity is perhaps the most acute threat. Although the country has abundant water resources, access to clean water remains a problem in many areas. Surface water accounts for 90 percent of the country’s total water supply, yet its quality is severely affected by high levels of deforestation and pollution from the agricultural and mining sectors. Just as so many other areas of the world, rising temperatures and decreasing rainfall levels cause droughts, reduce surface water and lower groundwater levels, especially in the so-called Dry Corridor in the southern part of the country. As a result, the Honduran agricultural sector, which employs more than 40 percent of the total labor force, is already seeing considerable impacts. Anyone who has visited Central America will know how important major crops such as maize, beans and rice are for the daily diet. These depend on stable rainfall levels, but current projections indicate that increasing temperatures and reduced rainfall will directly cause decreasing harvest levels in maize by 12 percent and beans by 32 percent by the year 2050 compared with 2000 levels. In addition, the country’s important coffee sector has already been significantly impacted by climate change in recent years, when changing rainfall patterns and higher temperatures reduced production by almost 25 percent. As these weather patterns become more frequent it will result in producers cultivating coffee at higher altitudes, and this change is likely to induce further land degradation and deforestation in previously uncultivated parts of the country. Finally, climate change is putting an extra strain on already stressed ecosystems, such as forests. For example, a hotter climate resulted in a bark beetle outbreak in 2013, which has resulted in a quarter of all forests in Honduras being destroyed. Reforestation is a way in which Honduras can help mitigate climate change. But this area leaves much room for improvement as the country maintains the highest rate of deforestation in all of Central America, a large part of which is illegal. In 2015, however, the country committed itself to the reforestation one million hectares by the year 2020 in exchange for US$314 million. And here lies the problem: although the Honduran economy is directly affected by climate change, the government has not yet realized that it requires a holistic approach if the country is to succeed in managing the economic risks posed by a changing climate. Climate change cannot just be an issue that is taken care of by international donors and multilateral organizations, which support the country’s rather weak Environment Ministry in writing basic climate reports. As part of the Paris climate agreement, Honduras committed itself to reducing its greenhouse gas emissions by 15 percent by 2030 compared to a business-as-usual scenario (for which there is still no definition). But this includes the caveat that this is if international donor conditions remained “favorable”. In short: we will reduce our emissions if you pay for it! You may think that a country as poor as Honduras – it ranks in 108th place in global GDP – is right in looking for funds to support its climate mitigation and adaptation. I am not arguing that it is not. But I am saying that while it is not responsible in causing the rising temperatures, it is severely affected by the phenomenon and therefore should develop a strong and holistic policy on the issue to avoid economic losses that result in job losses, poverty and migration. It is high time that the government understands that climate change impacts every aspect of Honduran life. Leaving the issue outside of serious government policy will put increased pressure on the government’s already weak capacity to address existing development issues, such as social and economic inequality, high levels of violence as well as low education levels. First the good news: According to preliminary figures from the World Wind Energy Association, overall global installed wind energy capacity increased by over 53 new Gigawatts by the end of 2018 to over 600 GW worldwide. But now the bad news: new onshore wind installations in Europe, the birthplace of the on-going energy revolution, dropped almost a third last year. The worst two performing markets were in Germany, which was down by more half compared to 2017, and the UK, where the rate of expansion seemingly collapsed. Reflecting on the numbers, “It’s very unfortunate that Europe seems to lose track,” lamented Gsänger from his offices near the United Nation’s Sustainability Secretariat in Bonn, Germany. Overall, new European installed capacity slumped down to numbers not seen since 2013, with just 11.7 gigawatts of gross wind power added. Throughout the European Union, twelve countries failed to install a single wind turbine last year, said Giles Dickson, CEO of industry body WindEurope. The numbers broke down to 8.6 GW of new onshore and 2.65 GW of new offshore wind capacity. (Note: these totals were also further affected by the decommissioning of 0.4 GW of wind turbines, most of which was onshore). New capacity additions were led by Germany, which installed 3.37 GW, followed by the UK with 1.9 GW and France with 1.56 GW. Despite falling rates, Germany remains the European leader with just under 60 GW installed cumulatively, constituting the third largest fleet globally. It is trailed in Europe by Spain, the UK, France and Italy (see preliminary WWEA figures here). Overall, wind power remains the EU’s second largest form of power generation and is expected to overtake natural gas in terms of new capacity additions in 2019, WindEurope said. But the pace of expansion is rapidly falling, threatening the realization of the entire group’s 2030 renewable energy goals. In an example of polite understatement, CEO Dickson commented that “there are structural problems in permitting, especially in Germany and France,” challenging the onshore wind industry’s growth. How big are those problems? Well, Germany’s new installations dropped over 55% last year, according to new figures from the German Wind Agency. Worse, unless there is a dramatic turnaround, new construction will likely fall at least another 20% to just two Gigawatts this year. If these rates continue, there is virtually no way the 65 percent renewable energy target set by the German government could be achieved by 2030, the industry groups warn. Why the drop? Industry groups blame Germany’s permitting process, which has become so complicated that it “can now take over two years compared to just 10 months” to get a green light for development. Worse, “even projects that get a permit are increasingly being challenged in the courts.” Current reports suggest that over 750 MW of wind farm projects are currently stuck in legal proceedings. As moods continue to shift, individual German states are also becoming more reluctant to identify new locations for wind farms. Germany’s new wind auction processes have hindered growth even further, seemingly driving away bidders. At its most recent auction, grid regulator BNetz only awarded 476MW of onshore wind capacity, well below the 700MW on offer. Now the third onshore wind auction in a row to be under-subscribed, “it’s clear the permitting process is not fit for the purpose,” said Dickson. Following the dismal results, the president of the German government’s grid regulator, (BNetz), Jochen Homann seemingly acknowledged that the problem was becoming systemic. “We must work together with the industry and the relevant authorities to find solutions to the licensing situation,” he said. Supposedly intended to enhance the participation of both community and industrial wind developers, the recent German Omnibus Energy Act set a higher tender volume over the next three years from 3,675 MW of new available wind energy capacity in 2019 to over 4,200 in 2021. Instead it’s had the perverse effect of slowing down Germany’s Energiewende further as the barriers to entry in the form of scarcer permits have only grown. Even though wind and solar energy are becoming increasingly competitive against coal, fossil gas and nuclear, all across Europe there seems to be a collective pause as Brexit, strikes in France, political disarray in Germany and reactionary governments elsewhere continue to stall green energy’s progress. Worryingly, “the outlook for new investments is uncertain,” said Dickson as the slump in the larger western European markets is matched (with the exception of Lithuania) with a “lack of ambition” in Central and Eastern Europe,” he continued. Europe’s energy policy is outdated. Regulation still supports a centralised energy system dominated by large companies that produce energy from nuclear and dirty fossil fuels. If we are to address the climate crisis, our energy system must be rapidly decarbonised. The good news: the momentum is there. Renewables are becoming cost-competitive and flexible, the energy system is becoming more decentralised, and technology now allows citizens to become active – individually and through community initiatives. This trend will only continue. According to a CE Delft study, almost half of EU households could produce renewable energy by 2050, about 37% of which could come through involvement in a cooperative. The study concludes that when demand response, energy storage and energy efficiency are included, 83% of Europe’s citizens could participate in the energy sector by 2050. In order to realise this potential, regulation and policy need to catch up. National markets are currently incapable of valuing benefits of renewables self-consumption, flexibility, and storage. Individuals and communities that participate in the energy market are treated by decision-makers, at best, as an afterthought and, at worst, a threat to be quashed. Governments have also further undermined markets by introducing new ‘capacity mechanisms’ that remunerate dirty power plants to sit unused. Energy transition advocates have waited with cautious optimism for the conclusion of a new energy market design (the Electricity Directive and the Electricity Regulation, respectively). Much anticipation has built up around new rules that empower citizens and new actors such as aggregators (that is, a third party that packages together small amounts flexibility or production so they can participate in larger markets) to become active in the market. The final political agreement is far from perfect. Nevertheless, together with the Renewables Directive, which we recently summarised, the new market design includes a potentially transformative concept: active energy citizens and communities. Why is this so groundbreaking? For perspective, in the EU’s Third Energy Package (concluded in 2009), citizens as active market participants were not mentioned even once. Now, citizen participation is a governing principle of Europe’s energy market. It is an important step in challenging the existing orthodoxy that ‘the market’ alone should guide the energy transition – all citizens and communities should have a fair opportunity to participate. Similar to the Renewables Energy Directive, which now defines ‘renewable energy communities’, the Electricity Directive will contain a definition of ‘citizens energy communities’ (CECs). Significantly, CECs are defined as a type of market actor based on membership, governance and purpose that is different from traditional profit-oriented energy companies. CECs can focus on renewables, but also any activity throughout the power sector. Originally, the Commission proposed ‘local’ energy communities. The change to ‘citizens’ is a significant win as it sends a political signal that this initiative promotes ownership by citizens, SMEs and local authorities, not larger industry or energy companies that simply want to create and control CECs to sell new services. Most importantly, CECs will have a right to ‘equal’ and ‘proportionate’ regulatory treatment and to access all markets on a level playing field with larger market actors. Citizens must also be able to establish CECs without facing discriminatory or burdensome hurdles, supported by enabling national frameworks. Likewise, Member States are required to maintain priority dispatch for smaller renewable generation projects at least until 2026. This will ensure that community-owned renewables projects can feed generated electricity into the grid. Moreover, CECs will have a right to share energy. This will empower citizens living in apartments, shared buildings or neighborhoods to innovate with storage, peer-to-peer trading, and other flexible technologies. CECs will not be required to be autonomous in their internal decision making. This safeguard – which is contained in the renewable energy communities definition – would have ensured democratic governance, preventing members with more resources to invest, like larger companies, from exercising disproportionate influence. Unfortunately, it will be optional for Member States whether to grant CECs the right to set up, own and operate local power networks. Many governments will simply ignore this text. EU oversight of capacity mechanisms will also be weak. While Member States will be required to assess whether capacity mechanisms are needed and must exhaust other options before adopting one, there is little the Commission can do if a Member State implements a capacity mechanism that is not warranted. 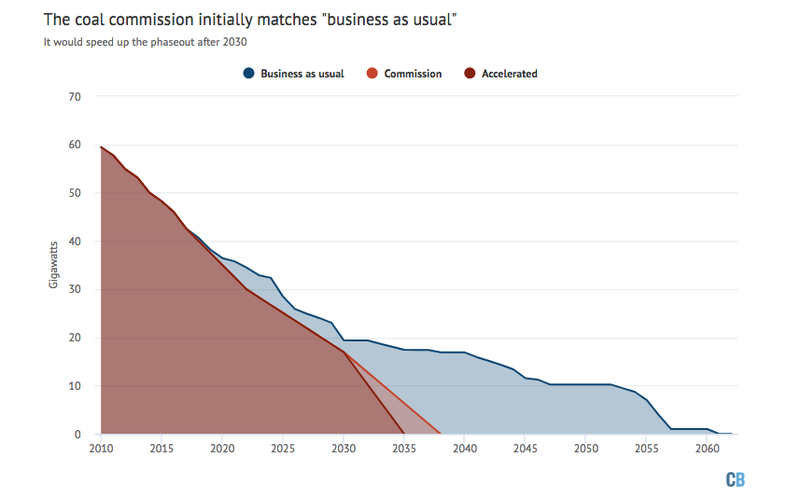 Furthermore, loopholes such as exemptions for installations finished before 2020 and CO2 limits that only apply to existing installations after 2025 allow new coal power plants to benefit from these mechanisms at least until 2035. This will shoulder consumers with huge costs, slow coal phaseouts, and undermine incentives to encourage citizen participation. Lastly, rules on how network operators charge CECs to connect and use the grid are contradictory. Rules promote both efficient and flexible use of networks while also allowing practices that cause inefficient use of the network. Complex debates between citizens, industry and governments on this issue are therefore likely. Now: the real work begins. Are all these changes really transformative? In truth, the real impact will only be visible after Member States transpose the new EU rules into national legislation. Success will be determined by the ability of governments to take their commitments, and the voices of citizens and communities, seriously. The transition to energy democracy will be long and hard. As for its role, the EU has given citizens an early win. Josh Roberts serves as Advocacy Officer of REScoop.eu, a federation that represents citizen cooperatives and energy initiatives around Europe that work on renewable energy, energy efficiency, and other clean energy technologies. He was in charge of coordinating REScoop.eu’s input into the negotiations on the EU’s clean energy package legislation. Prof. Andreas Goldthau leads the ISIGET project focusing on energy justice and the Global South. He holds a Chair in International Relations at Royal Holloway College, University of London and is an Associate with the Geopolitics of Energy Project at Harvard University’s Belfer Center for Science and International Affairs. Laima Eicke joined the IASS as Reasearch Associate in January 2019 and works at the ISIGET project on strategies for a global energy transition, its systemic impacts and special vulnerabilities of countries of the global south. Silvia Weko joined the IASS in 2019 as a research associate for the project Investigating the Systemic Impacts of the Global Energy Transition (ISIGET). This article has been republished from IASS Potsdam. The latest report by the Supreme Audit Office (NIK), Poland’s most important auditing body, is a deeply depressing read for anyone even slightly interested in the fate of renewable energy in Poland. The report shows how years of neglect, mistakes and indolence have accumulated and now threaten Poland with not just European-wide disgrace, but also serious financial consequences. Let’s look at things step by step: back in 2013 the share of renewables in the country’s total gross energy consumption amounted to 11.4% and it seemed that the target Poland had committed to (15% by 2020) was within reach. Three years later, instead of rising, the share of RES in Poland’s total energy balance was decreasing. At the same time, most EU member states were steadily increasing their percentage share of RES without any major disruption to their local energy markets. So, what has brought about this stagnation, or, indeed, regression? There were several causes that slowed down the RES market. The political responsibility can be shared equally between politicians from parties that are now in conflict – the previous government coalition of Civic Platform and Polish Peasants’ Party – and the current ruling party, Law and Justice. A large proportion of the revenue from derogation, an instrument designed to transform savings from free emission allowances into modernising the energy sector, was used to strengthen the coal sector. Short-term thinking and a search for financial means to renovate outdated energy generators prevailed. It seems there wasn’t enough money or ideas left for, for instance, cogeneration or the construction of gas power plants. In hindsight, we are able to see how erroneous this energy strategy was, also from a geopolitical point of view: in order to safeguard their energy system, Poles, who are so sensitive about their resource independence, are now importing increasingly more coal from Russia. In order to find other reasons behind the deep crisis, we must go back to 2015 and early 2016. NIK reports revealed numerous irregularities that accompanied the construction of wind farms (e.g. bribery, no public consultation). Under mounting pressure from opponents of wind energy, and state monopolists worried about the expansion of the renewable sector and potential market fragmentation, the government passed a law that effectively blocked the growth of renewables in May 2016. Lawmakers applied such rigour to investments that they simply became unprofitable. The same rigour applied to micro installations, which were intended to bring about the growth of prosumer and local energy, aimed more at the needs of detached houses or small farms than at powering the grid. Reports by Poland’s Energy Regulatory Office (URE) clearly indicate how much power of connected RES sources decreased. In 2016, it amounted to a total of 796 MW. One year later, it was five times less. Moreover, the transition from the complicated and ineffective system of green certificates to a bidding system ended in failure. In 2016, only four bids took place and in 2017 there were only two. Instead of helping to solve the crisis, the bidding system has increased it even further. 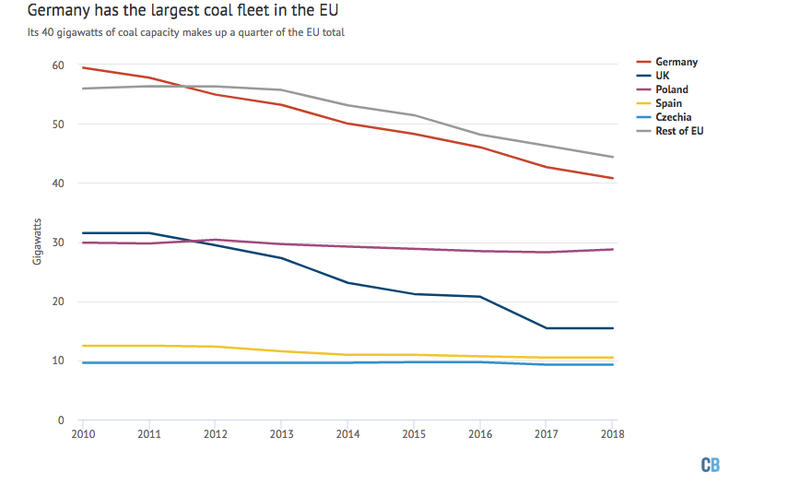 If to all this we add one of the highest indicators of CO2 emissions per kWh of produced energy in Europe, we arrive at a deeply unsettling outlook. The year 2020 will be a breaking point for Poland. If the country does not meet its renewable targets, it will be forced to engage in a so-called statistical transfer from countries who will have met their target with an excess. NIK’s initial calculations indicate that it may cost Poland as much as 8 billion zloty. And then there is the increasing cost of electrical energy resulting from ever more expensive emission allowances. The aspect of simple ambition is of least importance here (just to be clear: the target RES share for Poland was very reasonable). Let’s just say it outright: because of mistakes made by politicians, renewable energy sources aren’t working in Poland. We can already see that the consequences might turn out to be very painful for the entire country. Part three of three: read part one here and part two here. The buzz around U.S. congresswoman Alexandria Ocasio-Cortez’s Green New Deal (GND) for the U.S. skirts a keen discourse that’s been happening for a decade in Europe, namely that pitting green growth ideas against degrowth economics. This confrontation has to happen in the U.S., too – though for now AOC and her allies are taking a middle path with their program for ecological modernization. This is tactically smart. But in order to decarbonize global economies the GND has to jettison contemporary capitalism’s will to expansion. The GDN that AOC has presented so far – and it is, admittedly, a work in progress – bridges the camps of the no-growth and green-growth advocates. Perhaps, this is exactly what she intends to do; its vagueness on this issue may well be a clever tactical ploy to circumvent, or push down the road, a highly contentious critique of capitalism that would surely scare off some of her Democratic colleagues in Congress, more than 70 of whom have signed onto the GND. The cornerstone of green growth philosophy is that a greening of the economy – replacing fossil fuels with renewable energy, creating jobs in the cleantech sector, making agriculture and transportation sustainable – can happen within structures much the same, or even identical, to those of our current capitalist economy. In other words, there’s no contradiction between, or need to decouple, economic development and environment protection. Technology and investment can make the transition painless or even lucrative – for those with vested interests in the status quo. This is argued by some within Europe’s Green parties (though others buck it) as well as by the OECD and the UN development programs. In fact, in Germany, much of the country’s industry and private sector is now on board with the the idea of a green economy – after badmouthing it for nearly two decades as a business killer. Green investment, it is now argued, whether private sector or government, will create economic activity and wealth that grows the economy to everybody’s benefit (i.e. commercially created largesse will “trickle down” to lower-income strata.) There’s mountains of money to be made in green tech and the transition to a low-carbon economy, businesses and their lobby arms now claim. And they want in on it. Switching from one energy source to another can happen without sending a destabilizing jolt to the system, they argue. Business as usual can continue and even thrive when greening the economy. And then there’s the no-growth advocates who contend that green capitalism can’t stem climate change or the general, ongoing degradation of the planet. The neo-liberal system itself, predicated on unlimited growth, the exploitation of natural resources, economic inequality, and capital accumulation, has to change fundamentally, they contend. Economic growth, measured by GDP, means more production and ever higher rates consumption, which logically require ever more resources and energy to process them. This harms the environment in more ways than one, not least by exacerbating climate change. This is the argument of growth critics like German economist Niko Paech, author of the Liberation from Excess: The Road to a Post-Growth Economy. “What goods or services are such that their production, use, and disposal do not consume land, energy, or other resources?” asks Paech. “Passive houses, electric vehicles, eco-textiles, photovoltaic systems, organic food, power lines, combined heat and power plants, solar thermal heaters, cradle-to-cradle beverage packaging, car sharing or Internet services: none of them fulfill this condition.” Even digital services, he argues, require fossil resources, minerals, rare soils and metals – and they leave behind vistas of non-biodegradable tech-junk. A green makeover of the economy would probably increase production and energy use and thus our carbon footprint. Paech wrote those words in the weekly Die Zeit in 2012. Since then, investment in greentech and renewable energy has soared while — after dropping during the financial crisis — production, productivity, energy use, and greenhouse gas emissions have crept slowly upward in economies that have rebounded. 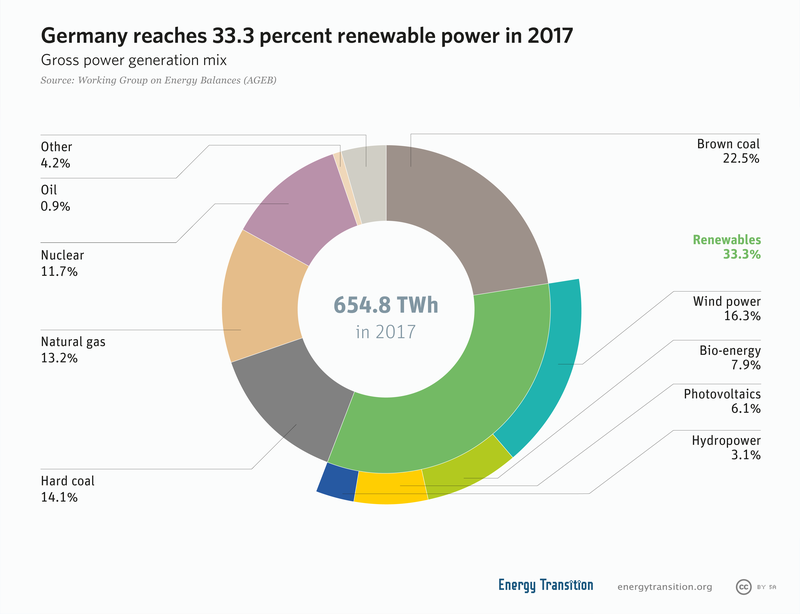 Germany is the most glaring example: its record-shattering growth since the crash has offset any significant beneficial impact of the sprawling Energiewende that has, among other achievements, turned 40% of Germany’s electricity use green. The degrowth camp’s arguments are all the more relevant in light of the earth’s rapid population growth and the development of undeveloped countries, which will only spur more consumption and thus greenhouse gases. The UN Environmental Program predicts that with nine billion people on the planet by 2050 we are likely to see resource consumption triple. Paech calls for a radical scaling back of our economies and lifestyles – an axiomatic condition of the degrowth movement. This means “de-globalizing” and “de-industrializing” our lives. In a post-growth economy, our work week would be slashed by half, giving people more time for one another and to fix things (rather than throw them out and buy anew.) Also, half of highways and 75% of airports should be closed down. Regional economies must be delinked from global value chains. Other de-growth thinkers call for innovative transition towns that offer social banking, taxation according to environmental consumption, and basic income models. Hopefully, this is exactly what will happen. A “growth” versus “no growth” debate within the context of the GND is exactly what can push it in this direction. It can help make explicit the shortcomings of our neo-liberal model and the possibilities of revamping our economy and our lifestyles for the better. “Blown Off-Course” is part one of a series on current wind energy challenges and opportunities. Upcoming blog posts will address the on-going tension between off- and on-shore wind development, challenges to onshore wind expansion, as well as the vital role community wind energy continues to play in Germany’s Energiewende. Warning signs are beginning to appear for the German offshore wind industry. With 276 MW of fully installed turbines far out at sea not yet feeding power to the electrical grid, a stubborn lack of grid expansion progress, and only a narrow investment pathway, investors specializing in offshore energy development are starting to look away from Germany. Even as larger turbines come online and are producing more energy less expensively, groups warn that political conditions are hampering the growth of Germany’s critical wind energy sector, with the vital expansion of both on and offshore generation at stake. According to new figures from the trade group WindEurope, total European offshore wind capacity grew by 2.6 GW in 2018. This includes about 400 new grid-connected turbines spread across 18 projects. Most of this new capacity (85%) was deployed in the United Kingdom and Germany, followed by Belgium and Denmark. Though investments in new offshore wind amounted to €10.3bn, a 37% increase over 2017, industry leaders UK and Germany connected slightly less capacity than previously. By the end of 2018, the UK had the largest amount of offshore wind capacity in Europe (44% of all installations measured in MW), followed by Germany (34%), Denmark (7%), Belgium (6.4%) and the Netherlands (6%). WindEurope also reported that the average size of individual offshore wind turbines continued to increase to 6.8 MW in 2018, up 15% from the previous year. However, the UK installed the world’s biggest offshore turbines – 8.8 MW – and opened the world’s largest offshore wind farm – Walney 3 extension, at 657 MW. Germany also opened their largest wind farm to date, as the Borkum Riffgrund II (465 MW) was fully connected to the grid. As for project owners, Ørsted connected the largest amount of wind capacity in 2018, followed by E.ON, Global Infrastructure Partners, Equinor and Macquarie Capital. In total, Europe now has 105 offshore wind farms comprised of over 4,540 turbines operating across 11 countries with a total capacity of over 18.5 GW. A further six offshore wind farms are currently under construction in Europe, including the giant Hornsea One in the UK; with a planned 174 turbines, it will be the largest offshore wind farm to date. Construction started in 2018, and in February the first installed turbines were ready to supply energy to the grid. According to the figures published by the German WindGuard, over a thousand offshore turbines with a total output of 6,382 MW were feeding into the grid last year. 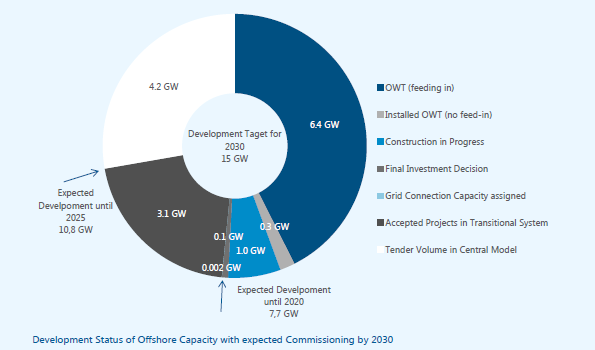 While another 276 MW of fully installed turbines remain unconnected, offshore farms with a combined capacity of 966 MW are also under construction while another 112 MW of potential capacity still await a final investment decision. Going forward, Germany’s legally possible expansion of 7.7 GW by 2020 is expected to be achieved as planned. However WindGuard and other industry groups argue that it is critical to raise expansion targets to at least 20 GW by 2030, particularly given the planned coal exit, which calls for the last coal-fired plants in Germany to close no later than 2038. 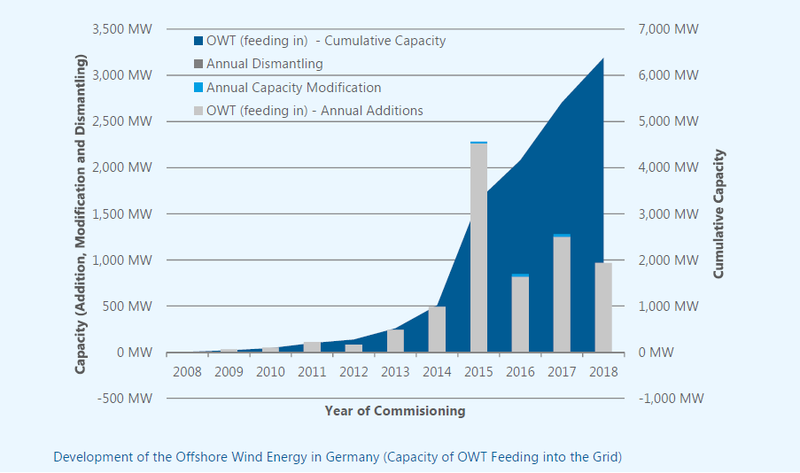 To break the deadlock, at a news conference in late January, several groups including the German wind energy association (BWE) and the Association of German offshore wind farm operators (BWO), called for a special offshore wind capacity tender for no less than 1,500 MW in the first quarter of 2019. Moreover, they stressed that the industry needs a reliable framework and a clear political signal. To achieve the goals of Germany’s coalition government to reach 65% renewable power by 2030, the offshore wind industry needs to expand to at least 20 GW by 2030 and at least 30 GW by 2035. However, “how offshore wind will contribute is not yet clear,” warned the groups. But there is good news for offshore wind industry: the German government will go ahead with power lines meant to move power from the windy north to the rest of Germany. In early February, Germany’s Federal Network Agency (BNetzA) finally decided on the route for the first part of a high-voltage power line. Such high-voltage power lines are seen as an indispensable part of the Energiewende, and the best way to balance the fluctuations of wind energy from the north and solar energy from the south. Operators and the German federal government want to build another 4,650 kilometres of new transmission lines by 2025, including four north-south direct-current, high-voltage connections. How that will happen is another open question – the plans have faced resistance from both citizen groups and advocates of distributed and community energy. But unless Germany develops, enacts and sticks to a pathway forward, how the nation will achieve the majority of its clean energy goals remains elusive. And while politicians continue to debate, impatient investors are already looking elsewhere. I moved to Tegucigalpa, the capital of Honduras, at the beginning of this year. It is my first time in this Central American country that does not enjoy the most favorable international image, not least because of the recent news of many Hondurans fleeing the country to the United States. This is a country with significant problems: the country has one of the highest murder rates in the world, and there are high un- und underemployment rates. This leaves much space for improvement in itself. But in this blog, I would like to focus on how an infrastructure project, meant to improve people’s everyday lives, was turned into a corruption scandal and, as a result, has put people off the idea of investing in a cleaner, climate-friendly and more efficient transport system. The first day I got here, I was struck by something that resembled a bus stop. It was not a usual bus stop, because its entrance was barricaded. As I got to know more of Tegucigalpa during the days that followed, I saw more of its kind – all barricaded – with separate lanes for buses, but no buses to be seen anywhere. Instead, public taxis and small so-called “public” buses (public only in the sense that they would carry more than one party at a time but otherwise privately owned by a transport mafia) move the 200,000 people dependent on public transit for their commute around the city every day. Such “public” buses represent a very inefficient and insecure mode of public transportation. They do not follow any set schedule, and there are reports of regular assaults of passengers. This is precisely why former Mayor Ricardo Alvarez initiated the new bus infrastructure Trans450 project in Tegucigalpa in 2010. The Trans450 was set to receive a grant of 50 million US$ by the Inter-American Development Bank (IADB) and a 20 million US$ grant by the Central American Bank for Economic Integration (CABEI) and to be finalized by the year 2017. Mayor Ricardo Alvarez had made the Trans450 one of his most important infrastructure projects during his mayoral terms between 2006 and 2014. He had secured the loans for the project and pushed it forward, even though both the country’s National Assembly and the Finance Secretary had voted against the project due to its high costs and high public debt. “At this point, it became very clear that this was going to turn into a corrupt project,” Ismael Zepeda from the Social Forum on External Debt and Development of Honduras (FOSDEH) told me. Subsequently, funds were either spent on building the infrastructure for the Trans450 or largely disappeared without any trace of the busses. Before Ricardo Alvarez’ mayoral term came to an end in 2014, he staged an inauguration of the project, ironically only with toy busses. Today, the project remains unfinished. The next mayor of Tegucigalpa, Nasry Asfuera, never regarded the Trans450 as his project, and as there were no more funds available, left it largely neglected. Some of the Trans450 lanes actually interfered with his own infrastructure plans to build new bridges and were subsequently destroyed. In addition, the Trans450 has met considerable opposition by the powerful transport mafia in the city who of course do not want to see any competition to their ‘private’ buses and taxis. This has left the Trans450 largely unpopular amongst Tegucigalpans. To them, the project does not only represent a clear case of corruption and a waste of public money but also a worsening of the transit system as some important pedestrian walkways had to give way for the project. They are now increasingly reclaiming the extra bus lanes to cope with the immense traffic in this city. The sad thing with this story is that the image of a cleaner, more efficient and secure transport option for Tegucigalpa has been destroyed through this messy and corrupt process. There are rumors that the municipality will take up the project again later this year, but I believe it when I see it. Over the next year, I will be writing more blogs on energy and climate related issues in the Latin American region. I thank the Heinrich Böll Foundation for this opportunity to share some of my thoughts with you via this medium. Old coal fields have to be cleaned up in order to be used again. Germany is using its old coal mines for renewable energy sources. L. Michael Buchsbaum talks to developers to see how it works. Coal mining has left the Earth pockmarked with countless abandoned shafts, open pits and tens of thousands of hectares of disturbed lands from old surface mines. Though many countries passed reclamation rules requiring mining companies to restore land back to its state after the extraction ends, mining companies have generally been slow to do so. The vast majority of post-mining lands are nowhere near as healthy or bio-diverse as they were prior to industrial activities. But more and more, regulators and energy companies are realizing that developing these degraded areas into renewable energy sites enables them to transform them into clean revenue-generating assets. As part of the European Commission’s support mechanism for transitioning away from coal, their Joint Research Centre published a study which looks at the best practices and opportunities throughout Europe, as well as suggestions of financial support (EU coal regions: opportunities and challenges ahead). The report and developers agree that after a mine closes, converting the site to a renewable energy generation facility can provide new job opportunities and economic value, as well as contribute to a more secure energy supply. Such projects can greatly benefit from the pre-existent infrastructure and land availability. The EC report finds that several coal producing regions in Spain, Greece and Bulgaria are particularly well situated for solar power generation while many current coal regions in Hungary, the Czech Republic and Poland have high wind availability. Throughout Germany the report cites several redevelopment examples. One great success is the Klettwitz wind farm in southeastern Germany, built on former surface mining lands. When it opened in 2000, it was the largest wind operation in Europe; today it includes five separate sections. And following recent upgrades and re-powerings, it has a combined generation capacity of 145.5 megawatts. Initially the biggest technical challenge of the pioneering project was the construction of turbines on unstable foil above the former pit. Now for almost 20 years, renewable energy has been generated “where previously climate-damaging coal was mined. A brilliant example of the green energy transition,” said Ralf Heinen, CEO of the developer, Ventotec. Nearby, developer ABO Wind Energy is approaching completion of a wind park on the site of the Lausitz Energie Bergbau (LEAG) owned Jänschwalde open cast mine. The second such project for ABO, it’s the company’s largest to date and they see “enormous potential” for similar brown-to-green undertakings in the future, said company spokesman, Dr. Daniel Duben. Prior to redevelopment, the site had been a more or less abandoned pit, filled in and awaiting recultivation for future farming. Mining activities at depths greater than 95 meters had left soil layers looser than those found in normal terrain, creating technically demanding construction conditions, ABO reported. “Though normally foundations for 200-meter high wind systems are only three to four meters in depth, that does not suffice at Jänschwalde,” said Duben. Instead the company used water to flush gravel deeper and then compressed the loose soil. They followed this up by hammering 32 concrete piles, each between 15 and 21 meters long, into the ground to keep the foundations stable. Because of this, the project is more expensive. “Normally it takes less than a year for the wind mills to generate enough energy and income to pay for their installation. It will take a bit longer for the former post mine site because of the size of their concrete anchors,” continued Duben. Nevertheless, ABO is now targeting similar sites. They view them as classic win-wins since one of the struggles for wind developers is locating sites where they won’t affect local wildlife, bird or human populations. Already impacted and cleared of trees and villages, former mine sites are “ideal” for such redevelopment. Though a handful of other companies are also moving in this direction, most avoid such redevelopment strategies because of the additional complications. But ABO is “keen on developing projects on these sites” because they “strongly believe in the necessity of energy transformation,” said Duben. However, despite the need to create viable post-mining economies, at present there are no subsidies or technical assistances offered from the state or federal government. In fact “there are more technical and legal barriers to overcome in Germany to build wind farms on former mines than at other locations,” continued Duben. Back in coal heavy North Rhine-Westphalia, fossil fuel dependent RWE AG has also redeveloped a sliver of their former mine sites into wind farms, in particular erecting the 67-megawatt Königshovener Höhe wind farm on a reclaimed site of their Garzweiler opencast mine. But frustratingly in NRW, only about 12% of gross electricity generation is currently generated from green energies–about half of which is wind, despite the region’s enormous potential. This is in stark contrast to other areas of northern Germany or the country as a whole which is now averaging close to 40% renewable energy. “Renewable development shifts the policy of the conservative CDU / FDP state government, which after taking over in 2017, is keen to slow down the expansion of wind energy,” said Dirk Jansen, head of the Friends of the Earth Germany (BUND). Indeed, though the Hambach and Garzweiler pits are virtually surrounded by wind turbines, the gigantic residual holes of the RWE mines are supposed to be flooded after the end of operations, negating any wind energy potential. Though other possibilities exist, both the state and RWE have been resistant to other alternatives. Worse still, the struggling “Coal Commission has also presented little in the way of concrete alternatives,” lamented Jansen. But perhaps presented with the success of other sites, RWE will adopt a different course. After all, there’s shareholder value at stake. South Africa’s electricity sector has emerged from a turbulent decade that has been tamished by corruption and mismanagement. Vested political interests within the electricity industry here could still be locking the continent’s biggest carbon emitter on its current course as one of the dirtiest and most energy-intensive economies in the world, writes Leonie Joubert. Last year’s record reduced water flowing through Germany’s Rhine River should be setting off alarm bells for myriad reasons. Ever-worsening climate change is reducing precipitation in its Swiss headwaters, suggesting that this year’s “low water event” will not be uncommon going forward. This water scarcity will also have a major impact on the future of the three giant open pit lignite mines in the Rhineland coalfields west of Cologne. The pits are owned by RWE, which must now realize how preposterous its long-term recultivation plans are when faced with climate change-induced droughts. Put together, the Hambach, Garzweiler and Inden mines produce around 100 million tons of filthy lignite annually, which is fed into three nearby RWE owned power plant complexes. These plants are some of the most toxic emitters in Europe, the source of some 75 million tons of annual CO2 emissions. 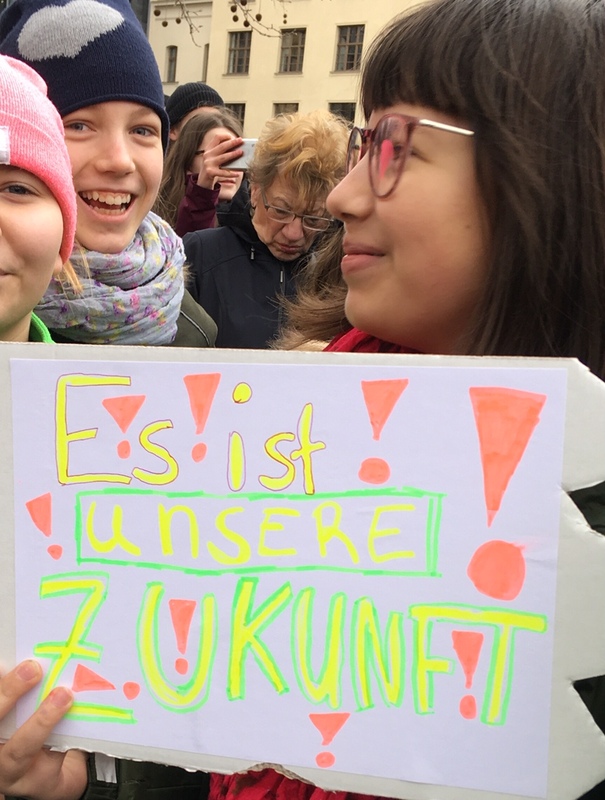 While opposition to coal mining and burning has increased, international media has mainly focused on the continuing clashes around the embattled Hambach Forest or the looming destruction of several villages dotted around the growing surface mines. Most people don’t know that RWE’s plans for land cleanup after mining are shockingly irresponsible. Producing over 40 million tons of lignite per year, the Hambach is the largest mine in Germany. Uncovering all that lignite requires miners to displace another 220 to 250 million square meters of “overburden” or soil, most of which is dumped nearby. Over 85 square kilometers in size and with mining operations in the pit over 500 meters (1,640 feet) below the surface, the Hambach is both the deepest and largest hole in Europe. But what’s to be done with the giant Hambach hole once mining is complete? RWE plans to turn it into a vast lake over 4200 hectares in size and up to 400 meters deep. To fill it, the company will require a volume of over 3.6 billion cubic meters of water to be diverted from rivers over a period of at least 40 years, most likely through 2100. However, the future artificial lake may be further enlarged if officials permit RWE to also flood the nearby Inden open pit mine as well as the older Bergheim pit. Either way, the planned “Lake Hambach” would become the deepest and, after Lake Constance, the second largest lake in Germany. It won’t be the only mammoth new water body in the area. Several kilometers away sits the currently expanding Garzweiler mine. When production there ends, also in the 2040s, RWE is planning to create Garzweiler Lake stretching across a 2,300 hectare surface area with waters over 200 meters deep. For this, the company plans to fill it up with another 60 million cubic meters of water per year, also over a 40-year period (roughly 2.4 billion cubic meters). Beyond then, even after the lake reaches a planned water level of 65 meters above sea level, it will still need to be topped up annually with another 25 million cubic meters more of Rhine water in order to offset outgoing flow losses from years of RWE’s drilling into the Earth and disturbing the natural ground water table in the area. Since the 1980s, RWE has “recultivated” much of the area by planting millions of trees, many of which populate the otherwise desert-like slopes of the largest artificial hill in Germany, the Sophienhöhe, sitting adjacent to and comprised of soil and dirt that was once inside the Hambach mine. However, polluted water run-off from this and other spoil heaps located directly beside the envisioned lakes will likely acidify them, fouling the diverted Rhine water and rendering the new lakes lifeless for decades to come as well as unsafe for most recreational activities. Though RWE and other companies proudly show off similar (albeit much smaller) artificial lakes–the largest only being only around 100 hectares–as positive post-mining land uses, experts admit that much of the “lake” water is unhealthy and humans should limit their recreational activities. In addition, it’s not even clear if RWE will be able to get the water to fill the holes: diversions of this size have never been attempted before. And given that the Rhine River is now regularly flowing lower than usual, it’s also unsure where this water will even come from. It sounds almost like a cruel joke: the water needed to fill in these enormous pits is getting scarcer, due to climate change exacerbated by the reckless burning of lignite. Finally, by flooding the mines, any potential for “standard” renewable energy to be built within these vast spaces will be eliminated unless expensive floating wind or solar farms are constructed. But even if RWE simply back-fills them with the removed earth, that’s not enough to allow renewable energy redevelopment. Once excavated and replaced, the uncompacted soil “swells” the land, rendering future wind-farming challenging as turbines cannot be safely anchored. That requires more expensive additional steps—as we will discuss in another post. As ludicrous as these schemes are, beyond filling the pits with Rhine water, there doesn’t seem to be a Plan B. Nevertheless, RWE and the state government of North Rhine-Westphalia insists that the mines should continue to be expanded for decades to come, seemingly unconcerned with what to do with the gaping holes once all that coal is removed. Part one of three: read part one here. It surprised no one more than the European authors of the original Green New Deal (GND) (see Part I) when U.S. presidential candidate Bernie Sanders and then his campaign manager, now U.S. congresswoman Alexandria Ocasio-Cortez, started pushing a sweeping, one-trillion-dollar Green New Deal investment plan over a ten-year period. The GND, they and environmental NGOs claimed, could create millions of good-paying jobs that would facilitate a just, rapid transition to 100% renewable energy – and in the timeline we need to avert the worst of climate change. And then, last year, in a matter of months, 45 U.S. congressmen and women, as well as hundreds of civil-society groups, signed onto the blueprint for environmental modernization.